Fig. 5. Anonymous, Converte Angliam (c. 1685), etching and engraving. British Museum, London, ©Trustees of the British Museum. Visual culture has never figured prominently in accounts of Early Modern England. Indeed, few historians have fully explored the possibility that printed images might have helped to inspire Shakespeare or Ben Johnson. 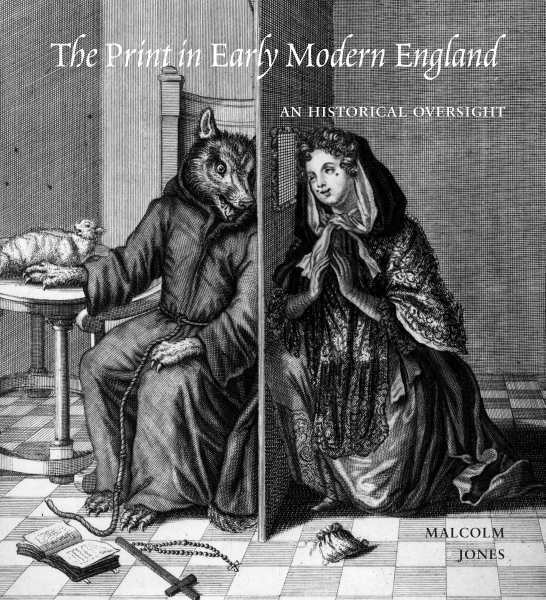 Thus Malcolm Jones’ massive new book marks an important foray into the overlooked early history of the print in England. As the title states, his subject is the life of printed images in Early Modern England, not necessarily prints by Early Modern Englishmen. 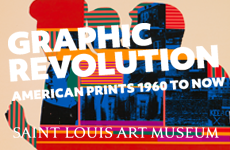 Most of the prints that appear here are in fact re-issues of images created on the continent. 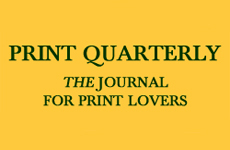 Jones readily admits there was very little printing from purely English designs, and only twice does he cite English designs later copied on the Continent (though one of these was known to Ben Johnson himself). 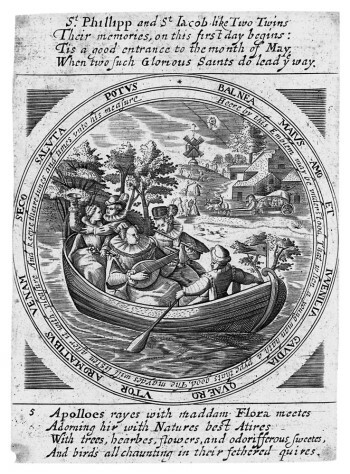 On more than one occasion, furthermore, Jones intuits that a particularly accomplished anonymous image must have originated elsewhere: he describes an apocalyptic print issued in 1643 as “so impressive it could not possibly be English.”[ref]1 p. 137[/ref] Jones is less interested in the insular native talent than in the plethora of savvy printers and re-printers active in London. His book convincingly argues that England enjoyed greater access to the continental ephemera—and was more influenced by it—than has been previously understood. Jones has already demonstrated his encompassing love of material culture in The Secret Middle Ages (2002). 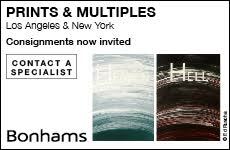 Adapting his approach to print culture, he has written a nuanced book that ranges far beyond a simple iconographical survey of the kinds of printed images that were available in London in the 16th and 17th centuries. Jones’ real interest lies in the everyday interaction of people and images. He has unearthed eyewitness accounts that suggest the presence of prints was a given, particularly for the wealthier and the literate who might browse both English and Continental prints at the print-sellers. These were not, for the most part, cherished as fine art and protected archivally. They were made to amuse and inform, things intended for common use and constant circulation or public posting, with the net result that most of them have disappeared. Fig. 1. Anonymous (possibly after Crispijn de Passe the Elder), May, from The Twelve Months (c. 1630), uncut trencher engraving on paper. British Museum, London, ©Trustees of the British Museum. Many are now known only from significantly later printings or from written descriptions. Jones uses a variety of sources to evoke what we have lost. Some are well known to historians, like The Stationer’s Company that approved all books, prints and pamphlets for publication, and also assembled a now invaluable register of the politically and ecclesiastically approved works from approximately 1557–1660. Others, however, are fascinatingly quirky, like the books of Thomas Trevilian. In his 1608 commonplace book (now at the Folger Library, and his 1616 Great Book (Wormsley Library, Buckinghamshire), Trevilian copied and reconstituted the text and images from hundreds of single prints and many entire series (including images for trenchers) now lost. Jones illustrates fourteen of these somewhat amateur renderings in color throughout his book. Trevilian’s throwback to an earlier manuscript copying tradition is somewhat perverse, given the fact that Trevilian was copying prints that were presumably available in multiple impressions. One wonders what Trevilian did with the original prints, whether he simply borrowed them, and from whom. Equally peculiar, he frequently separated the image and text of single prints by several pages. (Trevilian was not the only English person to “appropriate” (to use the contemporary art term) printed images: in the similarly obsessive Little Gidding Biblical concordances produced by the Ferrar family around 1630, prints were literally cut up and rearranged to illustrate scripture.) 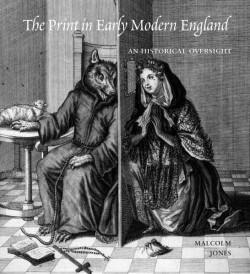 From these sources, and from the prints that have happened to survive, Jones approximates the scope of England’s once rich visual culture, and argues that this lacuna is historically important, whether the prints were appreciated at the time for religious reasons or as a simple means to keep informed of developments on the Continent. Fig. 2. Anonymous, December, from The Labors of the Months (17th century), round engraving on paper, colored and pasted on wooden trencher. British Museum, London, ©Trustees of the British Museum. Jones titled his introductory essay, “The Use and Circulation of Prints” to alert the reader to the variety of roles played by prints in this period. Although he looks, throughout the book, at the kind of single-sheet prints (with and without letterpress) that are the traditional subject matter of print histories he also considers items like printed playing cards and printed handkerchiefs, as well as other artifacts that were copied in, or, from prints: manuscripts, ceramics, embroidery, paintings, polemical medallions, and so on. 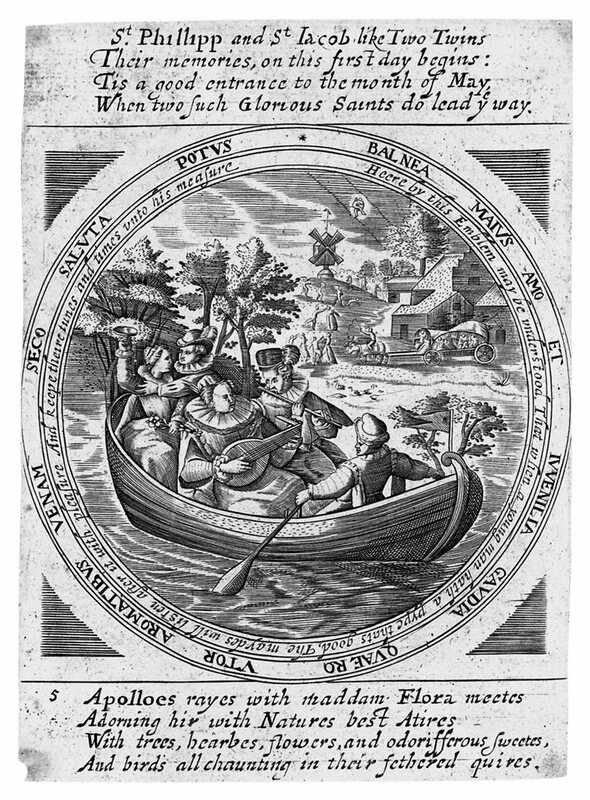 Jones’ lengthy discussion of the prints that were cut up and pasted down to decorate wooden trenchers (circular wooden trays for serving dessert) is particularly intriguing as the genre is almost an actual English invention, or at the very least, adaptation (despite the Netherlandish sources for many of the emblems) (Figs. 1-2). The images were often borrowed from European sources, but in England, the number of outer rings laden with moralizing text appears to have increased. These concentric circles, Jones points out, could have been used for resizing, allowing a single prototype to fit any size of trencher. 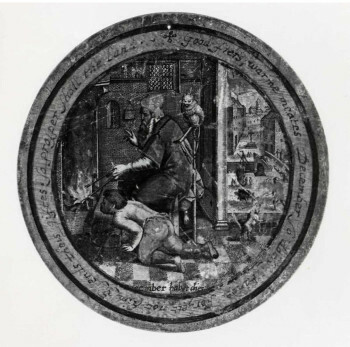 In the final section, Jones discusses the theme of functional prints again, looking at a set of four oval anamorphic prints that survives as both an uncut sheet (Bodleian Library, Oxford) and as decorations applied to a pill box (Dalgety Museum, Honiton), a parallel to earlier illustrations of several examples of prints pasted into coffers and onto the surfaces of other objects. These are particularly remarkable given how few such objects have survived. The culminating chapter, a Picture of Society, includes trick imagery and printed games showcases the incredibly wide range of printed items consumed by the English public. Fig. 3. Anonymous (possibly published by John Smith), The Bear-faced Lady (c. 1680s), mezzotint on paper. British Museum, London, ©Trustees of the British Museum. The book is lavishly produced and copiously illustrated: its 385 pages of main text are accompanied by a staggering 378 figures, including some 36 color plates, often including more than one print or multiple views of an object. This is especially helpful with works such as the Yale Center for British Art’s minute panorama whose street crier caricatures appear one at a time with a twist of a knob. (One small complaint: dimensions are not given in the captions; they would have been handy for unusual items such as the panorama or the pillbox. Knowing that the scale was in fact tiny would help confirm its function as a pill box.) The large scale of the illustrations means that most of the text within the prints is actually legible (when not, relevant portions are transcribed within the discussion or in an appendix). Jones has broken his text into iconographically-based sections titled ‘Series and Schemata’, ‘The Body Politic’, ‘The Moral Order’; and ‘The Social Order’― making room for the political, the morbid, the gendered genre, the prophetic, the humorous, and even the mildly pornographic. (Figs. 3-4) The piquant Converte Angliam, c. 1685 (British Museum) (Fig. 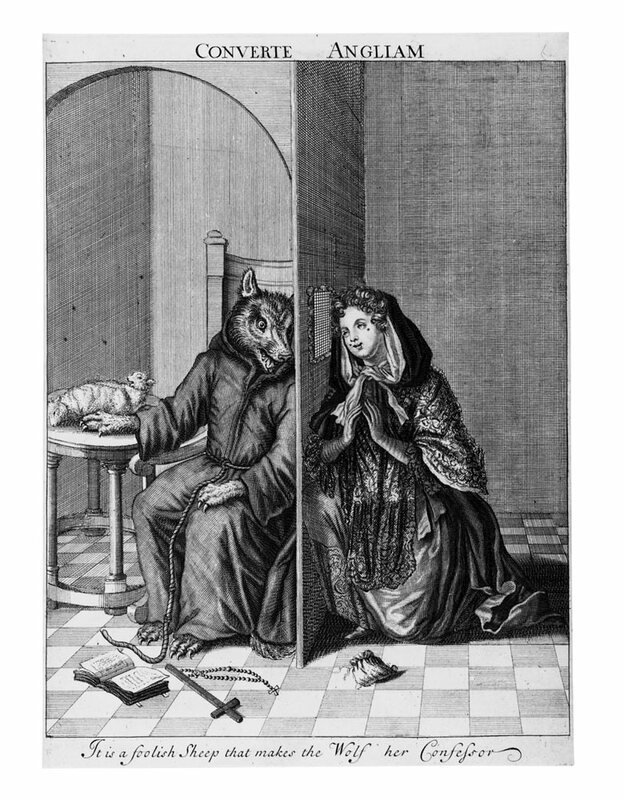 5), which appears on the book’s dust jacket, adopts the late Reformation trope of randy Catholic confessors preying on their flock: a wolf dressed in a friar’s robe prepares to devour a lady at confession. In addition to this sort of anthropomorphization, Jones devotes several pages to prints of clergymen explicitly having their way with eager nuns or parishioners. The prophetic and the monstrous also appeared in print in England, as in many sheets on misbirths predicting imminent doom. An apparently historical Bear-faced Lady also featured in an anonymous mezzotint (British Museum) (Fig. 3) is connected by Jones to a 1685 poem that dwells more on the figure’s fitness as a wife than on her potential as a bad omen: “Happy the Man to whom you must disclose/ The Flaming Beauties of your Rain-bow Nose!” Just as entertainingly, Jones discusses the The Cully Flaug’d, c. 1690, a mezzotint possibly from the same workshop at the Bear-faced Lady (British Museum) (Fig. 4), which details the interaction between an industrious harlot and elderly gentleman (Jones queries whether he may be a clergyman) who demands a good flogging. The print marks a clever inversion of stereotypes: youth trumps age, female trumps male, servant trumps master and even the trope of the bossy wife battling for the family trousers, is turned upside down by a gentleman who is presumably paying to have them taken away. (after Marcellus Laroon II, possibly published by John Smith), The Cully Flaug’d (c. 1690), mezzotint on paper. British Museum, London, ©Trustees of the British Museum. Throughout these various subjects, forms and uses of printed images, Jones makes us conscious of the prints’ own self-awareness. On numerous occasions, he cites text printed in the margins of these images to the effect that the print in question (often moralistic), should be posted in a place where its message would be most helpful: the Looking-Glasse for a Drunkard (from 1652), for example, announced it was ‘very needful to be set up in every house.’[ref]2 p. 205[/ref] Similarly, there were prints meant to be pasted over poor boxes to solicit alms, such as an engraved broadside from 1658 (Magdalene College, Cambridge) that carried the headline: “BESTOW ONE PENNY FOR THE LORDS SAKE And buy this Paper for the POOR’S Sake. Place it over THE POOR’S Boxe, in your Church or House, Shop or Inne, & c.”[ref]3 p. 191[/ref] The four desperate engraved figures beneath this decree likewise implore the viewer’s pity and open purse. The Print in Early Modern England is a testament to the discoveries still attainable through good, old-fashioned, archival research. While the holdings of major English collections such as the British Library and the Bodleian Library are relatively well known among specialists, Jones’ expended heroic efforts in scouring myriad collections throughout Europe and the United States. What he uncovered is a bounty that should dispel the myth of early modern England’s visual illiteracy, and transform the way we picture the life of that extraordinary, culturally dynamic time.